Does the science of evolution really prove that life, humanity, and the universe as a whole are meaningless accidents? On the contrary, as science has increasingly shown how everything in the universe is subject to evolution—including matter, life, and human culture—these very facts reveal that the process of evolution is unmistakably progressive. As we come to see how evolution has progressed throughout our cosmology, biology, and human culture, this reveals evolution's purpose—to grow toward ever-widening realizations of beauty, truth, and goodness. 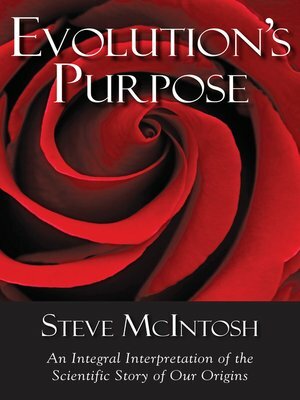 McIntosh argues that the purpose of evolution is not "intelligently designed" or otherwise externally controlled; rather, its purpose is being creatively and originally discerned through the choices of evolutionary creatures themselves. Without relying on any spiritual authorities, the author shows how the scientific story of our origins is actually a profound and sacred teaching compatible with many forms of contemporary spirituality. Taking us from pre-biotic forms of life right up through the development of human consciousness and our global civilization, McIntosh presents a fresh and compelling view of evolutionary science and philosophy that will inspire a deeper understanding of evolution itself and show how it can lead directly to a more evolved world.